(4) Figures to the right indicate full marks. 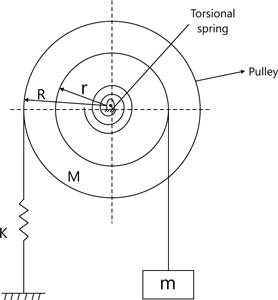 1 (a) Find the time period of small oscillations of an inverted pendulum and spring system shown in 'fig. 1(a)' given that the pendulum is vertical in the equilibrium position. Is there any limitation on the value of k? Compare the time period at vibration at the above system with that of one in 'fig. 1(b)'. (8 marks) 1 (b) A heavy door with door closing system as shown in fig. 2, has moment of inertia of door panel about hinge is 20kg-m2. If the torsional stiffness is 25Nm/rad, find the value of c.
(8 marks) 1 (c) Determine torsional stiffness of 80cm long annular aluminium shaft [G=40N/mm2] of inner radius 30mm and outer radius 40mm. (4 marks) 2 (a) A mass of 500kg is suspended with a spring. The system vibrates with a natural frequency of 3rad/s. If the initial amplitude is 24mm and subsequent half amplitudes are 20 and 16mm. Determine the stiffness of spring and coulomb damping force. Also find the number of cycles corresponding to 50% reduction of its initial amplitude. (10 marks) 2 (b) Find the natural frequency of the system shown in fig. 3. (10 marks) 3 (a) Analyze the problem in fig. 4 for steady state response of the mass. iii) The amplitude of vibration at resonance(8 marks) 4 (a) Use Lagrange's equation to derive the differential equations governing the motion of the system of fig. 5 using x and θ as generalized co-ordinates. Write the differential equation in matrix form. Where s=distance of section from the fixed end. (14 marks) 5 (b) Explain the construction and working of seismic vibration measuring instrument. (6 marks) 6 (a) Using Holzer's method, determine the natural frequency for torsional vibration system in range of 1 to 5rad/s. Draw mode shapes for frequency you have found.